Note: This story is embargoed until the date specified in the release: November 21, 2011. Los Angeles, CA., Nov. 21, 2011 – amidst all the controversy surrounding Sony Pictures’ recently-released film Anonymous, actor and author Michael York, O.B.E., launched a powerful, multi-pronged counter-offensive against the Shakespeare Birthplace Trust (SBT) in Stratford-upon-Avon, and its “60 Minutes with Shakespeare” authorship campaign, initiated in response to the film. York also announced a monumental breakthrough in the controversy – detailed evidence that Shakespeare traveled all over Italy. The problem for orthodox Shakespeare scholars is that the traditional author, Mr. William “Shakspere” of Stratford-upon-Avon, never left England. During a briefing at the Los Angeles Press Club’s Steve Allen Theater in Hollywood (10:00 a.m. to ~noon at 4773 Hollywood Blvd. – one block west of Vermont Avenue on the north side of street) Michael York, Hilary Roe Metternich, daughter of the man who discovered the new evidence, and John M. Shahan, Chairman of the California-based Shakespeare Authorship Coalition (SAC) lambasted the SBT for its Orwellianattacks against doubters, and for poor scholarship in its “60 Minutes with Shakespeare” website, featuring 60 SBT supporters, each giving a 60-second audio-recorded response to one of 60 questions posed by the SBT. Shahan challenged the SBT (online petition) to write a declaration of the reasons why they claim there is “no room for doubt” about the identity of “Shakespeare” and post it with the names of those who have endorsed it. He noted that the SAC wrote and posted a statement of its own position, the Declaration of Reasonable Doubt About the Identity of William Shakespeare, in 2007. It has now been signed by over 2,200 people – over 800 with advanced degrees, and nearly 400 current or former college/university faculty members. Hilary Roe Metternich announced the discovery of powerful new evidence in the controversy, contained in the newly-released book, The Shakespeare Guide to Italy: Retracing the Bard’s Unknown Travels, by Richard Paul Roe (HarperPerennial). Ms. Metternich, the daughter of the author, a prominent Pasadena attorney who died late last year, said that her father spent more than 20 years traveling in Italy, his only guide being the texts of Shakespeare’s 10 “Italian Plays” (not counting three plays set in ancient Rome). October 13, 14, 15, and 16, 2011 in Washington, D.C.
A tour of the Folger Shakespeare Library has been scheduled for October 14. The 2011 joint authorship conference sponsored by the Shakespeare Oxford Society and the Shakespeare Fellowship will be held in Washington DC from October 13-16. Arrangements have been made for a block of rooms at the Washington Court Hotel. The program will include a tour of the Folger Library with a viewing and discussion of the Earl of Oxford’s Geneva Bible. Arrangements may be made for a trip to a local Cineplex for a group viewing of Anonymous. Speakers who have already made proposals or signaled their intent to speak include Mark Anderson, Roger Stritmatter, Bonner Cutting, Gerit Quealy, Richard Waugaman, Ron Hess, Barbara Burris, Cheryl Eagan-Donovan, Tom Hunter, Tom Townsend, Albert Burgstahler and Earl Showerman. The SOS and SF are dedicated to academic excellence, as defined through the independent scholarship of several generations of scholars, among them J.T. Looney, B.R. and B.M. Ward, Charles Wisner Barrell, Charlton Ogburn, Jr., Ruth Loyd Miller, and Mark Anderson, among others. 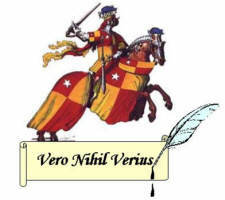 The primary focus of both organizations is to consider and advance the case already argued by these and other writers identifying Edward de Vere, 17th Earl of Oxford, as the true mind behind the mask of “Shakespeare.” Although papers exploring alternative authorship theories (e.g., Mary Sidney, Francis Bacon, etc.) are welcome, presenters should bear in mind that conference attendees are for the most part well versed in the arguments for and against Oxford’s authorship as presented in these seminal works. Those desiring an audience for alternative authorship scenarios, or writing from an orthodox “Stratfordian” perspective, should prepare themselves by carefully considering the expectations of their audience. John Hamill, Earl Showerman, or Bonner Cutting. The Conference is scheduled to begin just two weeks after the expected release of a Sony Pictures film, Anonymous, directed by Roland Emmerich and featuring a cast of Shakespearean thespian luminaries such as Vanessa Redgrave, David Thewlis, Joely Richardson, Rhys Ifans, and Sir Derek Jacobi. The tantalizing trailer ends with a clever tagline — “We’ve All Been Played” – followed by a stage filled with actors taking their bows and the audience applauding wildly. In light of the scheduled release of this major motion picture – the first-ever that explicitly challenges the traditional authorship theory – the Shakespeare Oxford Society reiterates its position that traditional scholars have been “Barding up the wrong tree” in Stratford-upon-Avon. Indeed, there is a long and distinguished history of doubting the traditional “Stratfordian” attribution of the “Shakespeare” works. Noted doubters over the years include Mark Twain, Henry James, Orson Welles, Charlie Chaplin, and Sigmund Freud. More recent skeptics include U.S. Supreme Court Justice Antonin Scalia and former Justice John Paul Stevens along with renowned Shakespearean actors Derek Jacobi, Michael York, Jeremy Irons, and Mark Rylance, former artistic director at the Globe Theatre in London. Happy Birthday William Shakespeare? This April 23rd … Toast But Verify! YORKTOWN HEIGHTS, NY – April 21, 2011 – Traditional Shakespeare biographers claim the great poet and playwright, William Shakespeare, was born on April 23, 1564. But before you raise your glass to salute the Bard’s 447th birthday this April 23rd, consider this: You just might be paying tribute to the wrong person. That’s the main premise of the forthcoming Sony Pictures film, Anonymous, directed by Roland Emmerich and featuring a cast of Shakespearean thespian luminaries such as Vanessa Redgrave, David Thewlis, Joely Richardson, Rhys Ifans, and Sir Derek Jacobi. The tantalizing trailer ends with a clever tagline — “We’ve All Been Played” — followed by a stage filled with actors taking their bows and the audience applauding wildly. In light of the scheduled release of this major motion picture – the first-ever that explicitly challenges the traditional authorship theory – the Shakespeare Oxford Society reiterates its position that traditional scholars have been “Barding up the wrong tree” in Stratford-upon-Avon. Consequently, the Society recommends that Shakespeare lovers around the world should adapt Ronald Reagan’s “Trust but Verify” dictum. Indeed, there is a long and distinguished history of doubting the traditional “Stratfordian” attribution of the “Shakespeare” works. Noted doubters over the years include Mark Twain, Henry James, Orson Welles, Charlie Chaplin, and Sigmund Freud. More recent skeptics include U.S. Supreme Court Justice Antonin Scalia and former Justice John Paul Stevens along with renowned Shakespearean actors Derek Jacobi, Michael York, Jeremy Irons, and Mark Rylance, former artistic director at the Globe Theatre in London. To resolve the Shakespeare authorship mystery once and for all, the Shakespeare Oxford Society has called for the creation of an independent, blue ribbon commission composed of distinguished, internationally recognized experts in relevant fields – including historians, biographers, jurists, and other esteemed writers and scholars. All members of the proposed Commission should be unbiased. They should declare going in that they have open minds on this subject and are willing to follow the evidence wherever it leads – using internationally recognized evidentiary standards employed by leading historians and biographers. The Society is proposing that an unbiased educational institute, think tank, foundation, or individual should take the lead in sponsoring the proposed commission.